hundreds of meter in every direction down the mains and services. 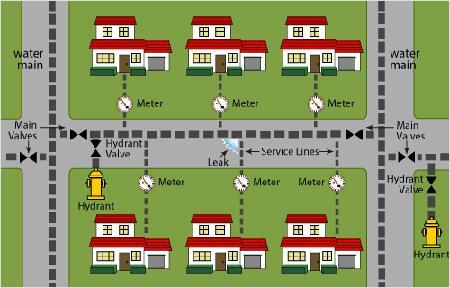 leak sounds at the meters, valves, and hydrants. Leak sounds travel on pipes. level picked up with sensor during the sound hearing. The Saved data file is indicated on LCD by the graphical display. water in the house so that you are not confused by the consumption noise. Please pay attention to the consumption noise which is almost same as the leak noise. 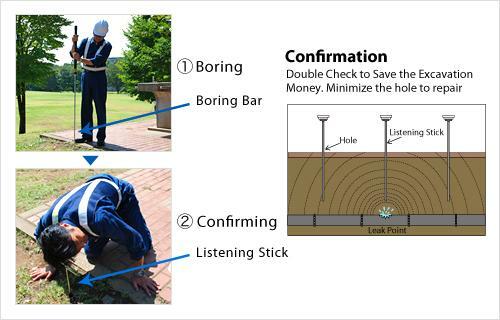 Leak surveying by listening at a meter with contact rod. location, the graph of readings etc. 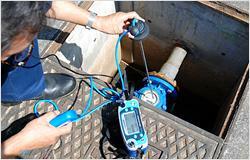 Sound levels taken at different meters and valves can be saved up to 250.
level every 40-50cm directly over the pipe. Sound levels taken at different positions along the pipe run, can be saved. 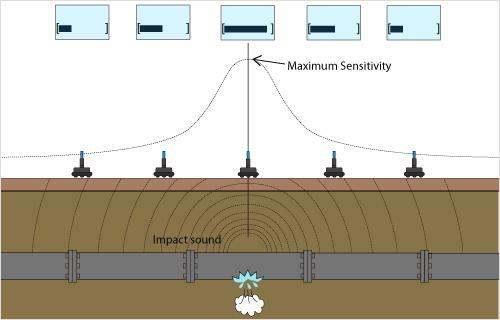 indicating the point of maximum leak sound and the position of the leak. A "Bar Display" gives a visual indication of the sound level. 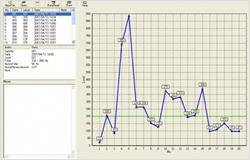 The "Saved" data file showing 10 leak sound levels and graphical display. 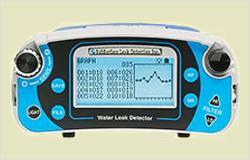 pinpoint the leak's location for you instead of relying upon your hearing. sound and the position of the leak. so as to final Pinpointing. Confirmation does save you time and money. Noise Reduction feature which reduces the effect of transient noises. The NR system, This system removes transient and fluctuating or varying noise and delivers only the "constant"
The NR level imposes a delay between the time when the push button is pressed and the sound is heard. Increasing the Noise Reduction Level increases the effect of this feature. NOTE: The pick-up sensor must be in contact with the ground when the push button is pressed in the NR mode. Failure to ensure this will give incorrect results.